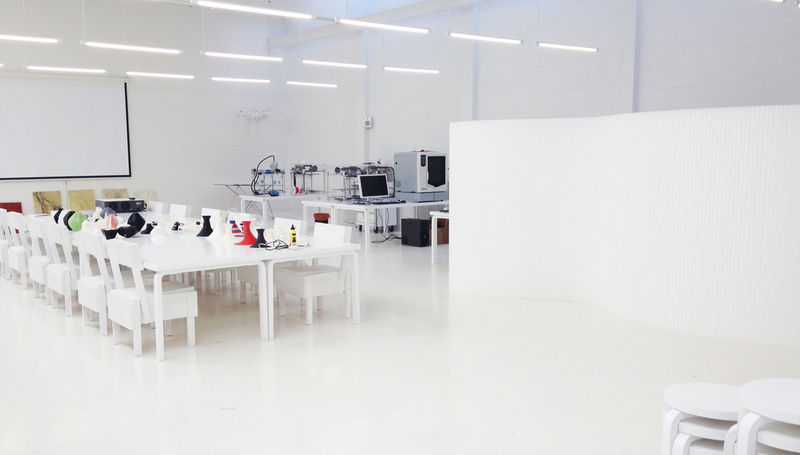 ADD is situated in an industrial facility of the School of Engineering in Aalto University’s Otaniemi campus. The spatial identity was designed to combine the functions of exhibition space and research facility, to be a vitrine for experimentation and at ease with its industrial surroundings. There is a constructive tension between the facility’s industrial past and expectant future. The present, the now, is emphasized by ADD also being a living social space with a café open to the public. The space is all white, leaving it open to interpretations – it can be seen as a cultural venue, institution, research center, social space, creative studio, or fabrication platform. And, to an extent, the ADD space is all these things. That is also why it adapts to different kinds of visiting events such as AIP 3D printing seminars, the Erratic installation, and the Aaltoes “Build It” 3D workshop. The ADD multi-use space is a large, bright, welcoming learning environment dedicated to hands-on learning. The space adapts to both informal and formal, open and closed uses. The ADD multi-use space is a workshop area with different machines, an interchangeable exhibition wall to display ongoing research, and a lecture space. It is the home to the ADD THOUGHT lecture series as well as the ADD VARIANCE and 3D printing workshops. Aalto University students can access the multi-use space during ADD office hours. The Library is open to the public and visible from the ADD CAFE. It has a variety of books based on architecture, design, art and fashion. Alongside the publications the library wall is lined with an informative and interactive installation featuring each lecturer, workshop and project documented on an A5 card with a photo and printed description of work, practice, and strategy. The wall works as a visual history of the lecturers and workshops ADD has hosted.